This day trading strategy can be used to produce profitable short-term trades on GBPUSD, EURJPY, AUDJPY, and EURUSD. But it is also applicable in other markets. 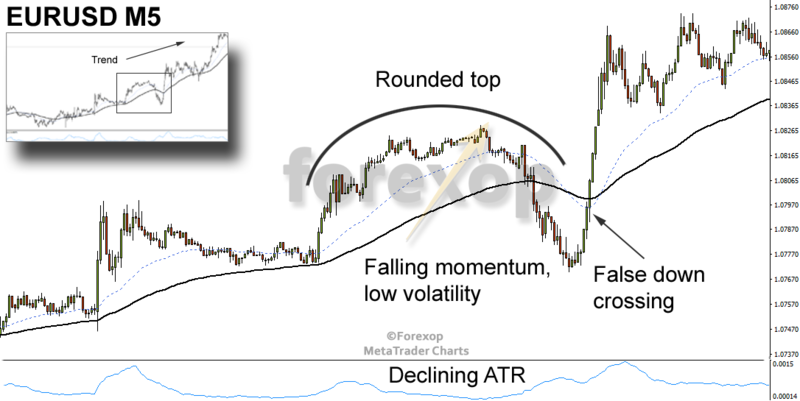 The method involves trading the false top/bottoms that occur on chart patterns known as rounded reversals: Namely “rounded tops” and “rounded bottoms”. Chartists also call these patterns saucers and inverse saucers respectively. They can also resemble cup and handle type patterns. I call this a contrarian strategy because the entry signal tends to be the opposite of that given by most technical indicators. Basically it is a system for trading fake (false) chart tops & bottoms. 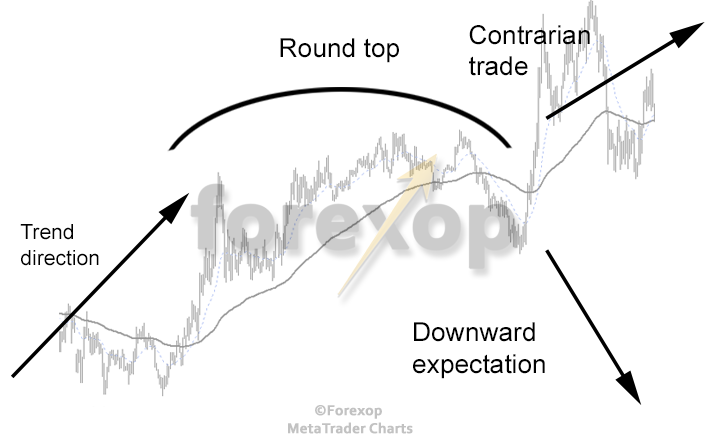 The conventional wisdom for trading tops and bottoms is to trade in the direction of turn. That is, for a rounded top, trade the downside (sell) and for an inverted pattern trade the upside (buy). On back testing it can be shown that doing the opposite of this often yields better results. This reverse method is described here. I have found that the strategy works best on shorter time frames; one minute to one hour. In these cases the chart pattern usually doesn’t represent a significant change in fundamentals but rather has a short term technical cause. On larger time frames, these patterns usually represent changing fundamentals and therefore I don’t advise applying this approach in these cases. The basic chart pattern known as a “rounded top” is shown in Figure 1. First of all I just want to say a few words about contrarian strategies. A contrarian approach basically means going against the view of the herd. In simple terms when the majority thinks a security is going down in price, then the contrarian trader will buy. When the crowd believes the security will rise, the contrarian sells. There is some fairly compelling logic behind this view. Let’s consider a concrete example: EURUSD. If the view of the majority of traders is that EURUSD is going down (EUR weaker, USD stronger) then this implies most market players have already positioned themselves for this move. Namely they’ve already sold EUR and bought USD and therefore the information is already fully reflected in the current valuation of EURUSD. More to the point the action of the crowd has created a temporary disparity between sellers and buyers. This is because, all things being equal, there are now fewer sellers in the market since the consensus was that a down move was going to take place and therefore given a balance between buyers/sellers most shorts have already been placed. This lack of sellers creates temporary upward price pressure, thus confirming the contrarians’ view and taking the market upwards. The setup for this strategy is as follows. I used a 14-period window for the ATR indicator and the crossing of the 50/20 moving average lines. I find these good for the 5 minute chart. Though, you may want to experiment with different values depending on what (and at what scale) you are trading. The upside and downside trading rules are explained in the diagrams below. The basic rule is to look for a top in an upward trend or a bottom in a downward trend. I define the trend here as the direction of the 50 point moving average line. Look for patterns where an initial burst of momentum moves the price, and this momentum gradually sags but without a sharp counter-correction. The price will form a dome shape. In my experience the best opportunities lie in the early phases of a new trend. As a trend matures, the chances of a real correction become greater and so you’d want to avoid using the strategy in those cases. Rounded tops and bottoms are fairly easy to identify on the chart. Look for formations where the top (or bottom) forms a smooth arc of near uniform curvature. The volatility should ideally remain low during the entire formation. The complete formation should also be confirmed visually by looking at the price action. For example see Figure 4. Confirm that there are small body candles throughout the curve formation. The presence of several big price swings within the top/bottom should be seen as a counter-indication and reason to hold off. 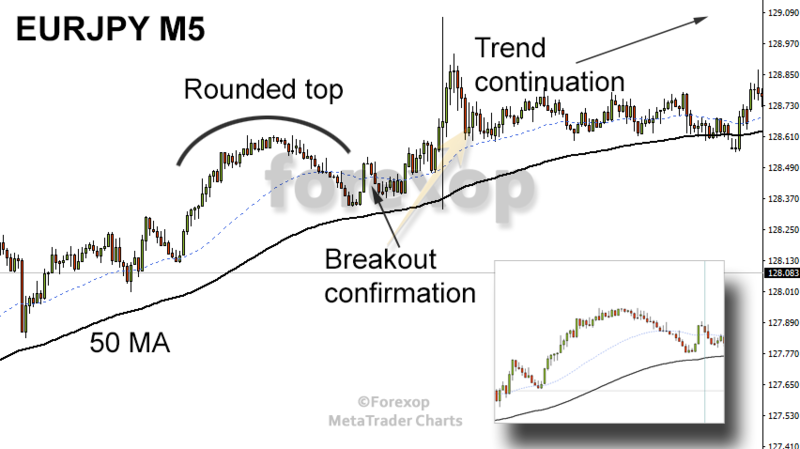 Fundamental causes: On the shorter timeframes round tops and round bottoms often appear in the early phases of a new trend: namely, within the first few waves. This happens after a bull or bear run has turned and a new trend in the opposing direction is forming. The top (bottom) happens where the initial momentum is exhausted by the first wave of buyers coming into the market. The low volatility suggest there isn’t a conviction to push the market lower at that point, however the collapse of early buyers fails to drive the market up any further in that phase. After a drop in price, the second wave of buyers enters the market and this takes the rally up a second leg thus producing a “false chart top”. See Figure 5 for a near perfect example of a round top and subsequent breakout. You can also use the ATR (Average True Range) to check the volatility throughout the pattern. The ATR indicator is a measure of price deviation. Ideally the signal should be between the middle and bottom of its range during the sequence. An ATR window between 14 and 50 should suffice. This will depend on the scale of the chart patterns you’re looking for. The ATR signal will often form a downward arc, mirroring the fake top or the bottom in the chart. See the lower graph in Figure 5 above. This happens as the volatility reduces and increases again during the formation of the dome pattern. It’s a matter of choice if you wait for a false crossing of the moving averages. Some traders prefer to do this because it sets an objective trigger point on which to start. However because this system uses stop orders the trades will only fire if the price actually does breakout in the expected channel. In the examples shown below I am using the moving average pair 50/20. In the first example in Figure 6 the lines do indeed cross just after the formation of the rounded bottom. The crossing clearly triggers a number of buy orders in the market because the price blips upwards for a few hours. However, momentum is weak and so after some consolidation the original trend reasserts itself and sends the price lower again. In the second example in Figure 7 the moving average lines do not cross after the formation of the rounded top. A minor breakout shown in the chart fails to follow through but the primary trend does indeed resume in the same direction. These kinds of events can still be traded cautiously by using order placement. In the example shown in Figure 7, buy stop orders are placed at the initial breakout level and then at higher price intervals in the direction of the break (see Figure 8). In this example the additional orders would fire around the second peak after the rounded top. Here the trend does indeed resume strongly in the same direction thus confirming the chart top was fake. With this strategy I strongly recommend entering the market with stop orders. Use buy stop orders for false tops when an upside break is expected. Use sell stop orders for false bottoms when a downside break is expected. A buy stop order executes only if the price rises to a certain trigger level. A sell stop order executes only if the price descends to a certain trigger level. The reason for using this approach is that your trades will only trigger if the price does indeed breakout along the path you expect. There is a chance that the break will be a double-fakeout but generally that risk is quite small. By splitting your entry up into several packets you also reduce the loss should a double-fakeout happen. I generally split the order into three units of equal size. For trading a false top, the first stop order is placed above the current price level just as the top formation is completing. See Figure 8. This anticipates the subsequent upside breakout. The next order is placed at the mid-price of the formation and the last is placed around the peak or just beyond. These orders are all placed at the same time. 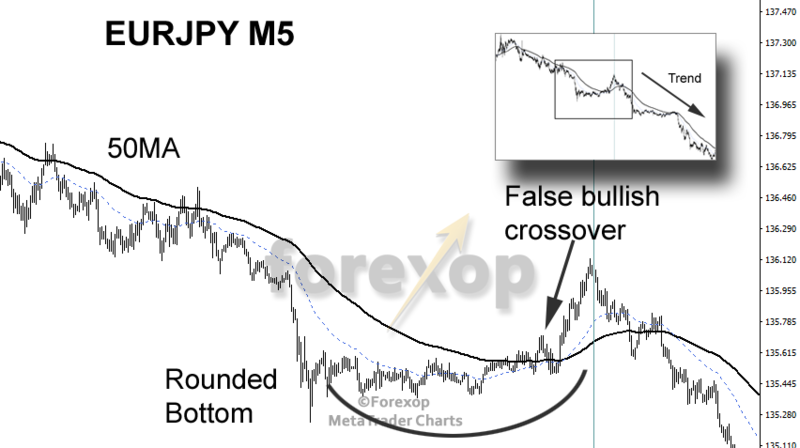 Take the following example trade in AUDJPY on the five minute chart (M5). The orders are placed 20 pips apart, and are split into three blocks. All three orders are placed at once with their respective entry price. The order book is shown in the table below. This shows at which tick each respective order will execute. However note that all orders are actually placed at tick 0. With this 5M chart, each tick is 5-minutes. I set the exit so that the last order generates at least 20 pips (including the spread). This sets the exit point at 100.98. At tick 83 (after 6.9 hours) the price reaches the exit point giving the following P/L for the complete trade sequence. When deciding stop losses, the best approach is to look at the chart and find a significant support or resistance level. For example, with a false top (buying), look for support around the level of the last peak before the formation. This support should form the stop loss area. Alternatively, if the previous peak is too close, use the previous trough. Simply do the reverse for a false bottom, looking for resistance just prior to the arc formation. Tip: It’s not worth chasing the price a long way out of the immediate formation area. If the price drops below (when buying) your support level it’s a clear sign that the anticipated trend continuation isn’t going to happen. Therefore cut losses and exit. If you used a staggered entry hopefully you won’t have been fully committed to the trade anyway. The method I’ve presented is a technical system for trading fake chart tops and bottoms. These are frequently signalled by rounded tops/bottoms also known as saucer patterns. It can be used as a day trading strategy on lower time frame charts: Namely one minute (M1) to one hour (H1). I don’t have clear evidence that this system works on higher timeframes. When these kinds of chart patterns are seen at larger time frames they tend to represent a shift in fundamentals. For this reason I don’t recommend it be applied there. I also don’t recommend it be used on mature trends which look prone to correction. This is a contrarian strategy. Most technical analysts will suggest trading in the opposite direction to what I am suggesting. 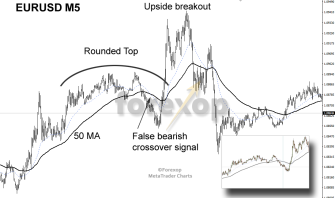 It often goes against many technical indicators such as moving average crossover and sometimes MACD. 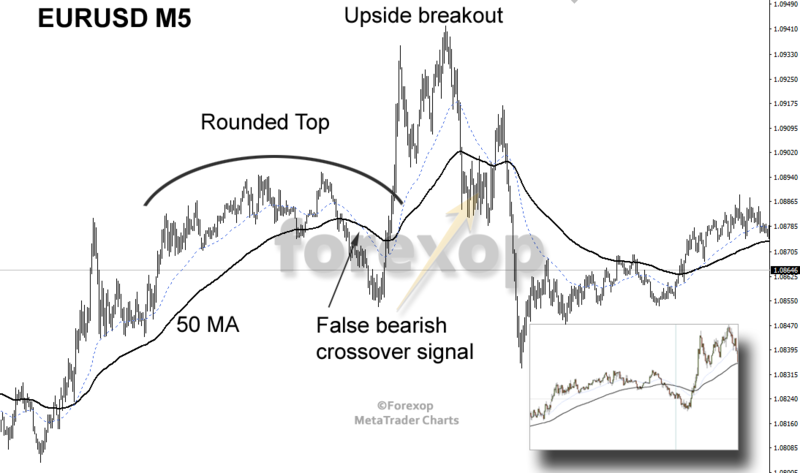 However the method has proven to be empirically successful as in retrospect many of these top/bottoming technical signals prove to be false (see charts above as examples of this). I suggest the use of stop orders rather than market orders. This acts as a double confirmation. If the price does indeed breakout along the expect path, the orders will fire otherwise they will expire (or are cancelled) with no loss incurred. I am a professional trader of index futures and we trade these chart patterns but we call them belltops and bell bottoms. The technic was similar more or less the one you describe. Have you got any kind of detection tool for this or its done by eye? One of the things we found was it is hard to find an indicator to do the pattern finding and it has to be done by a trained eye. What are your thoughts? Yes you are right finding the right setup is a bit of an art and not an exact science. I have traded these formations by sight so far. Once you spot one or two you get a feel for them; that said there is usually a combination of a few things coming together like the trend establishing, the waning momentum, the lack of any abrupt correction and so on. We are at the moment adapting a range finder to do the detection and will report how that goes in follow up posts.